Yesterday was Memorial Day in the United States. For those of you who don’t live here, it’s the day we honor our military veterans, as opposed to Veterans’ Day, which is the day we honor our military veterans. Confused? So are most Americans. 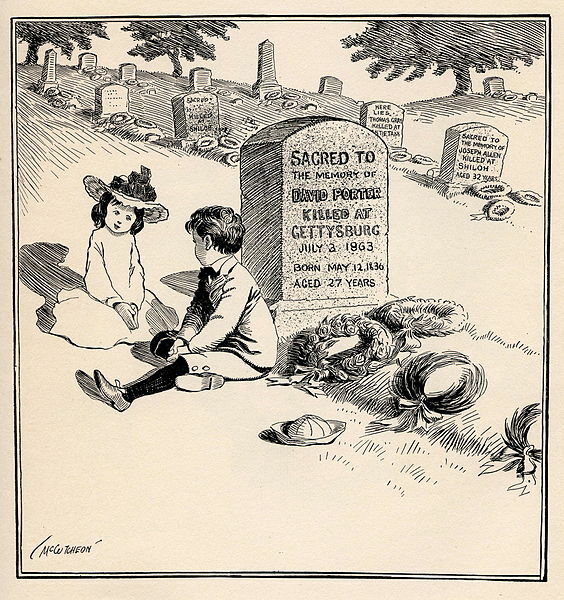 Memorial Day is a child of the Civil War and mid-19th century death rituals, combining the spring ritual of cleaning and beautifying the family cemetery plot with honoring the far too many soldiers who had died during the Civil War (1861 – 1865). Ironically, the combination seems to have begun in the South to honor the rebel dead, but the May 30 date for the holiday (before it shifted to a Monday holiday) was that adopted in the North to honor the Union dead. The holiday was also long known as Decoration Day, reflecting its composite nature. Over time, the connection to the Civil War has been mostly forgotten, and the rituals of cleaning the family cemetery lots have been reduced to having government authorities plant flags on veterans’ graves, whether they died in combat or not. The connection to the Civil War hasn’t been entirely forgotten in the South, however, where eleven states still celebrate a separate Confederate Memorial Day (under various names). 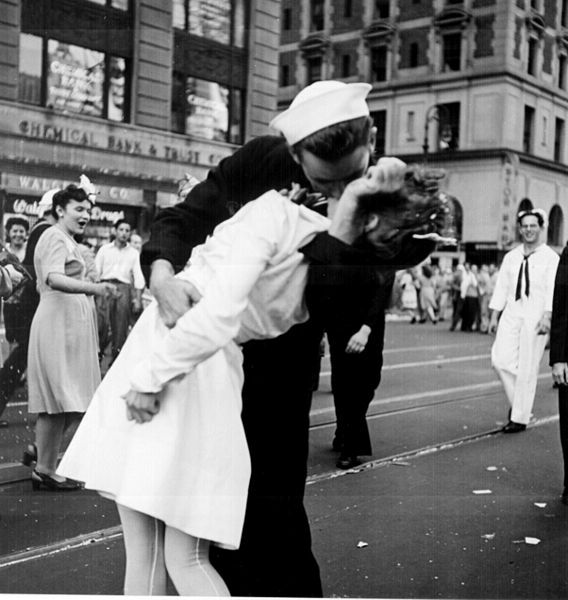 This famous photo was taken on V-J Day in 1945. Wouldn’t kissing (between consenting adults) be a great way to celebrate the end of wars? One would have thought that a date to commemorate fallen soldiers would be directly connected to a war, but May 30 had no such connection. For that, we turn to Veterans Day, which is celebrated on November 11. This used to be called Armistice Day, because it celebrated the end of fighting in the “war to end all wars,” the First World War, in 1918. (Ignore the fact that American soldiers kept on fighting in Russia for months afterwards.) World War Two had a bigger impact on Americans, but Congress decided that it did not want to start celebrating the end of every war as a holiday, so Armistice Day became Veterans Day and was stripped of its specific history. Oddly enough, officially the United States did celebrate the end of World War Two, Victory (over Japan) Day, for almost thirty years, but the holiday got little attention. It is still celebrated in Rhode Island, much to the embarrassment of state officials when hosting a Japanese trade delegation in the 1990s. This curious state of affairs, two holidays celebrating veterans, has been rationalized by claiming that Memorial Day specifically honors soldiers who died in our wars (although not necessarily in battle) , while Veterans Day honors all those who served in the military. Making the situation even odder, while both holidays were converted to Monday holidays in 1971 (thanks to lobbying by the tourism industry), Veterans Day was converted back to the historically significant date of November 11 in 1978, even though that date is irrelevant to what is now the holiday’s official meaning. Admittedly, the reason for the shift probably had less to do with history, and more to do with the uncomfortable closeness of the Monday-holiday version of Veterans Day to Halloween, an association that displeased veterans’ organizations. Memorial Day was always the bigger holiday when I was growing up in New England, both for our town and for me personally. It’s a tradition in many communities for the veterans to march in a parade on Memorial Day, and in the 1960s that was a big event in my home town. There were a lot of veterans of World War II, including my father, and they had big families, so there would always be a large turnout. Other civic groups and organizations would also take part in the parade, so it was a big deal. 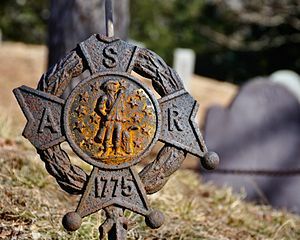 Before the Federal Gov’t supplied flag-holding grave markers for veterans, groups such as the Sons of the American Revolution provided them. I remember planting flags in many of these. On top of that, my father was the town’s veterans’ agent in those days, which meant he was the part-time town employee helping veterans get their state and Federal benefits. One of his jobs was to put small American flags in the markers by every veteran’s grave in both town cemeteries. This was a task he delegated to us kids (though under his supervision), and my brother and sister and I would spend a wonderful spring day running through both cemeteries, trying to find all the markers and place flags in them. To this day, when I think of Memorial Day, the memory of planting flags in the cemetery is what comes to mind first and foremost. This entry was posted in History and tagged cemetery, Memorial Day, Veterans Day, Victory Day. Bookmark the permalink. This sounds as confusing as our (UK) Armistice Day, aka Poppy Day, which is commemorated on 11th November (whatever day of the week) with 1 minute silence at 11 am (no holiday), then again on the nearest Sunday (as a Christian country, still considered a holiday, even though it’s not) with military parades and local dignitaries laying poppy-made wreathes on the local War Memorials. It has not yet been combined with Guy Fawkes (the chap who tried to blow up Parliament) which is officially 5th November but now seems to extend from Halloween through to Poppy Day. Then again, there is VE Day (Victory in Europe), 8th May, and VJ Day, (Victory in Japan),15th August, but neither of these are generally celebrated (except on the 25th, 40th & 50th anniversaries) thus ask the average Brit what’s the date of those and you’ll receive a blank look. And once again, Brian, you’ve done a grand job of educating us Brits who only know of the American culture as seen in the ‘flicks’ (ok, that’s the movies). That may not be true for 100%, but we’re mostly ignorant of everything else. That would have made an interesting parallel: Armistice and Guy Fawkes Days in the U.K., Veterans Day and Halloween in the U.S. Most people over here know Guy Fawkes, if at all, thanks to the movie version of “V for Vendetta.” So we have our own ignorances to overcome, too, despite Britain being the “mother country” for so many of us. Possibly the oddest such difference I encountered when over there, apart from the Northumbian bartendress who pronounced “jalapeno” with a hard “j” sound, was the sense of distance. My hosts for the first stage of my 1993 trip considered a trip halfway up the Thames Valley much the way I’d consider a trip to Buffalo from Boston. Hey, we’re a small island, and distance, like time (and wealth) is relative. But it is something I’ve often thought of. Okay, now I have the problem of being so easily tired by the shortest of journeys, but before then, how reluctant I was to go visit my youngest daughter who lives in the Midlands. What, that’s a very great distance! Yet when I was dating a chap from Surrey, I thought nothing of a jumping a bus on a Friday morning – for a cultural weekend in the Capital, of course. All relative. My own version of this is that when I had a car of my own and was single, I thought nothing of driving as far as New Jersey on a leisurely Saturday drive, while without one these days my casual excursions are limited to where the MBTA (subway/bus/commuter rail) system runs. Before the dreaded CFS hit, and when I was still in the entertainment biz, to get away from the buzz, I’d take walking holidays with my daughter (middle, No 2). It was my delight to push the local travel agent to his/her limits working out how to get me from A to B on National Coaches. Sometimes it was quite a feat. Once at our base camp (usually an out of season self-catering caravan or flat) we’d go off in all directions by the local bus service, and walk back. It was during those holidays that my daughter coined FLAW (Famous Last Words) for my too often repeated assurance that, ‘of course we can walk that distance’, and ‘this will be a fabulous short-cut’. You might get the impression we often arrived back at camp somewhat tired. Food. Bath. Bed. Do it again in the morning. Gosh, how I miss those days. Reminds me a bit of walking along railroad tracks with my father and siblings. The railroads in our town were little-used, so this was not a dangerous practice. My mother always found a reason not to join us (namely, “I don’t want to walk all that distance”). Where I used to live we had an old disused railway track that doubled as a public footpath. On a pleasant Sunday afternoon I would take the girls out for a walk. And invariably the miles would mount up. My kids were the fittest on the block, (correction, in the village), and that walking habit has stayed with them through to adulthood. My cousin who is in the Air Force put a blurb on Facebook the other day clarifying the difference between the two. I think it’s an important clarification – considering she’s alive. I once thought that Memorial Day was supposed to cover just those who died in battle, which would seem a natural distinction, but it is NOT the one that is made. I suspect that’s because it did originate out of the Civil War, when so many soldiers died of disease, or lingered with critical injuries, or survived an injury only to die from a subsequent infection. Those soldiers considerably outnumbered those who actually died IN battle. Yet they were all seen as part of a great loss. Hey BLB – sorry for the belated reading 🙂 You probbaly know that I’ve lived five years in California. I arrived there on the Cinco del Mayo 2004. I must share this with you. As someone who was born and raised and lived – by that point – all her life in Israel I was astounded to see “Memorial Day Sale” signs all over the place. Memorial Day in Israel, celebrated the day before Independence Day (according to the Hebrew calendar, it’s always around late April, early May) is strictly and very respectfully observed, by law : no restaurants, pubs, movie theaters etc. are open. The Hebrew radio stations play sad songs, voluntarily. Hebrew TV channells are unbearable with this Zionistic mourn of “our deads”. The night beofre (that’s because the Jewish day starts and ends at sundown) and then the next day there is a one-minute siren, and everyone stand still for one minute. You can see cars stop on the highways, people get out of them and stand. There are ceremonies all over the country, in every elementary, middle and high school and then at memorial parks, city squares and what-not. Now, being a post-Zionist, who always questioned the necessity of wars in the Jewish-Palestinian conflict, I always felt uneasy with these days (Israeli Independence Day too). However, once I saw this casual attitude of Americans to this day, I learned to appreciate the way my country treats its fallen. When they are alive, its leaders prefer much more to send them to terrible stupid wars then make any effort for peace to save their lives. In many cases they are treated like cannon meat. Yet once they are dead they are surly respected… shame they can’t enjoy it! Well, Americans both respect them more and less, it’s different. You’re right about the holiday: Memorial Day in the United States is less observed, less thoughtful than in Israel. We did have a one-minute observance once, but it was for Armistice Day/Veterans Day. On the other hand, we’re going through one of those periods in history in which it is politically suicidal and culturally dangerous to question the honor and value of the military. It’s the third era in my lifetime. Prior to about 1970, the military was honored, but so many of the powerful men had served in WWII that they had fewer illusions about the military. For a while starting around 1970, the Vietnam War discredited the military among quite a few people. But now we’re in a period when few people have military experience, and they believe the military is all that stands between us and THEM, so the adulation has become uncritical. That’s not a universal attitude, but it is the dominant one.